Where: Below an appropriate regulatory sign. Purpose: To indicate that the sign applies to drivers of vehicles operated by the company, owner or organisation indicated by the logo or words. Action: If your vehicle belongs to the company or organisation indicated by this sign, obey the regulatory sign. Where: Below the appropriate regulatory sign. 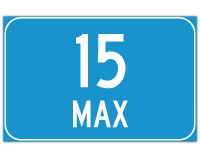 Purpose: To indicate to the driver that the reservation indicated on the regulatory sign is further restricted by a maximum number of vehicles as indicated on this sign. Action: Do not enter an area if that would mean there would be more than the number of vehicles indicated.